I wondered what the story was about the arrangement of these buildings. I couldn't figure out why in the world somone would build a tiny (unattractive) building so close to the side of the of such a beautiful old building. Thanks for another great story of how Durham became what it is today. At one point, it was the intent to tear down the Trust Building and erect a twin tower to the Hill Building, linking the two together up to the 6th floor with two separate towers. When I worked at the CCB Facilities Department from the late 80's to mid 200's, we had a sketch/ rendering of the twin towers in our plan files. There were also a lot of original sketches and trash paper drawings and details in the files from the original construction of the Hill Building including a set of the original blueprint and elevations of the building. The two story "addition" has always been a part of the Hill Building, designed by the original architect as shown by these drawings. Unfortunately, I understand the much of these were pretty much decimated after a while after SunTrust came to town. Edgar also at one time had drawings and sketches showing how the two-story section could be "saved", incorporating an entrance to a below ground parking area in the "carved out" basement of the Hill building. The unfortunate side-effect of even considering to remove the 2-story section is that it was designed and built as a part of the Hill Building and to remove it would mean massive structural work on the tower foundations and load bearing walls of the tower as the basement of the Hill Building extends completely under the 2-story section as well. Believe it or not, there is even a door linking the Hill and Trust Buildings in the basement! My grandfather, Dr. George T. Watkins, Jr. and his brother, Dr. William M. Watkins had their medical practice in this building as well. My grandfather died in 1948 but my uncle kept the practice in the building for many years. My grandfather owned multiple houses in Durham, among them 1030 W. Trinity Avenue and 310 Watts Street, where I grew up. He also owned a farm where much of 15-501 is now on the way to Chapel Hill---thus the name Watkins Road. 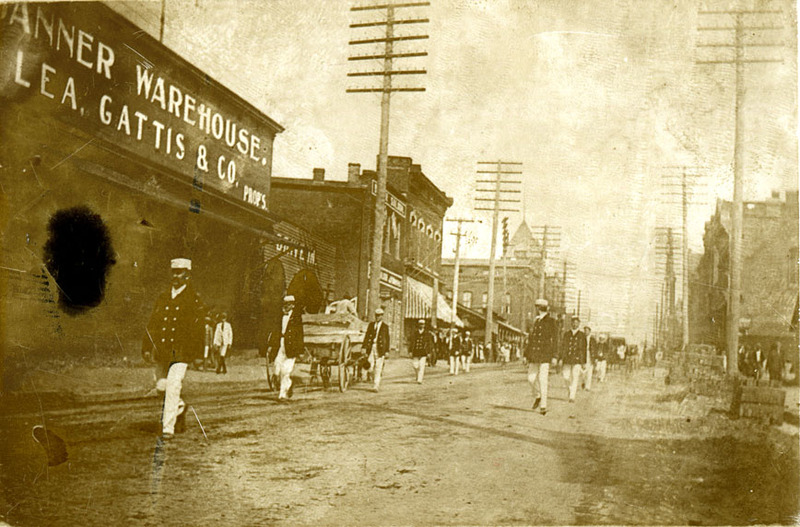 The 200 block of West Main St. was first the site of one of Durham's earliest major warehouses before it was home to Durham's first skyscraper; the Banner 'Drive In' warehouse was built on the site during the 1880s. 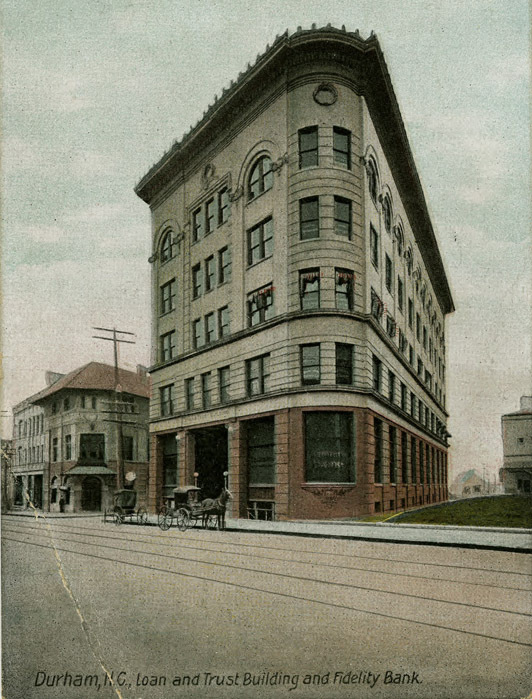 The major tenants for the building for many years were the Fidelity Bank, presided over by Benjamin Duke until his death in 1920, and the Home Savings Bank, established in 1904 by George W Watts, and John Sprunt Hill. 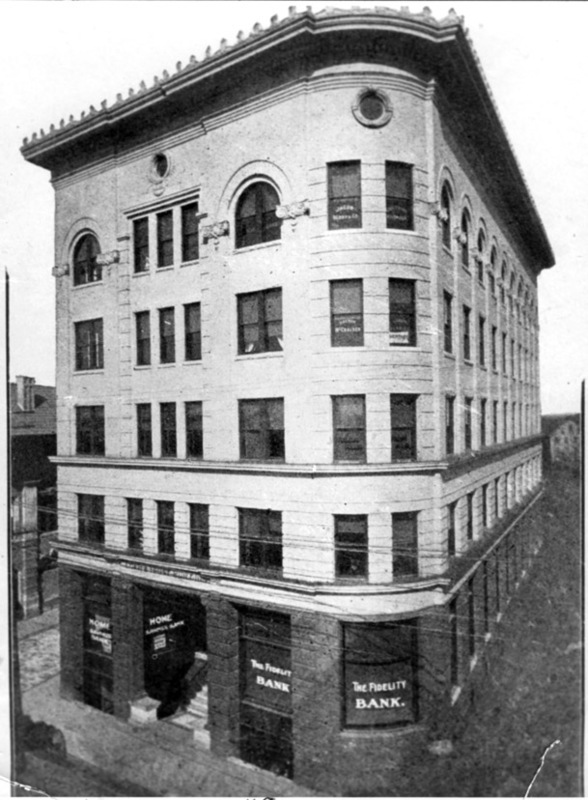 The Fidelity was located to the right of the main entrance, the Home Savings Bank to the left. Multiple office tenants took space upstairs. By the 1920s, Hill sought to expand the wood-frame Trust Building, and commissioned architects Atwood and Nash to design a north-side addition. Atwood and Nash designed an addition that would repeat the existing design vocabulary. Northern elevation of the proposed addition. The addition would have closed West Parrish Street at Market Street, extending northward into/to then-Rotary Park. Above, the original rear of the Trust Building, with the original Rotary Park and Gazebo in the foreground to its north. Ultimately, Hill passed on the Atwood and Nash plans, deciding to build, in 1932, a sixteen foot deep in-place concrete addition designed by George Watts Carr. The modernist/art deco styling of the addition was a stark contrast to the classical details of the original building. At the same time, the 'split-level' entry at Main Street was changed - the walk-up first floor was lowered to street level (with steel joists and concrete/terrazzo floor,) and the basement was reduced to "generous crawl space." 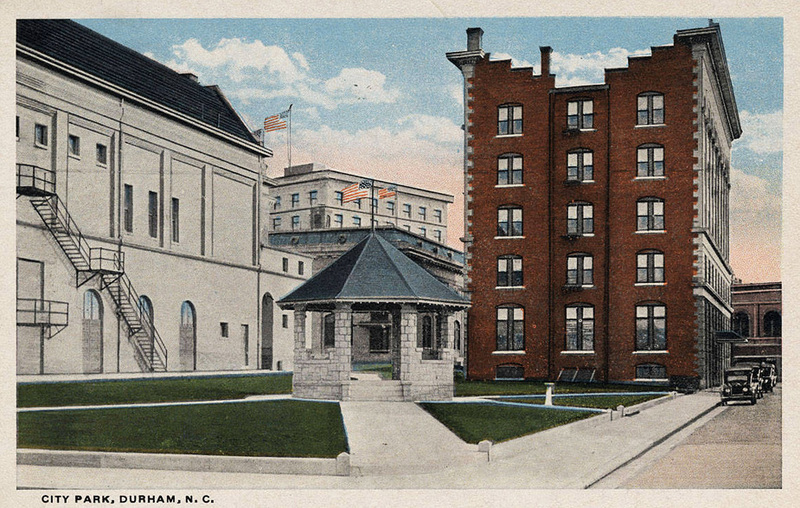 The construction of the Hill Building in 1937 unfortunately obscured the architecture of the Trust Building considerably, burying much of the eastern facade. The "Looking northwest" picture above would not be possible today. 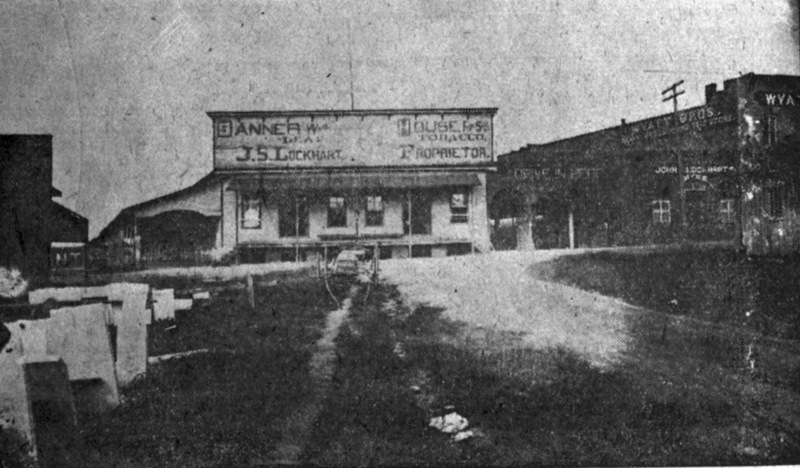 The alteration of the first floor was accompanied by replacement of the first floor glass storefront openings with masonry archways. In the 1950s, the bottom floor underwent further 'modernizing' that befell so many of the buildings downtown, as the quoins on the pilasters were filled in to create a smooth stuccoed surface. Edgar Carr theorizes that Hill likely planned to eventually demolish the wood frame Trust building, Generally, my sense of what is good design aligns very well with a preservation instinct. However, at times, the two are discordant. This is one of those times, where I'd certainly support the demolition of this strange little two story section that butts up against the Trust Building. Edgar had drawn some impressive renderings / plans that demonstrate the significant advantages of opening this section. Unfortunately, this is unlikely to happen. Any redevelopment of the Hill Building is likely to use historic tax credits, and getting State Historic Preservation Office approval to remove this section of the building, as badly designed as it may be, is unlikely. But it would be the best design solution for both buildings, as well as for downtown. I would guess that neither Greenfire nor 21c have seriously explored the possibility. Also, the firm of I.G.